The world is full of extraordinary schools. We feature three inspirational stories about courageous teachers, second-chance education and progressive pedagogy in Yemen, South Sudan and Colombia. Education against the odds. Yemeni children attend classs in a school building damaged by a Saudi-led air strike in Taez. How do you keep schools open in a war zone? The salaries of Yemeni teachers stopped nearly a year ago. But they continue to educate their students. Sawsan Al-Refaei reports. Donya Al Hilali is awakened almost every day by the horrifying sounds of air strikes and missiles dropping close to her home. She hastily completes her morning chores and rushes to school in Taiz city, walking the unsafe roads so as not to be late for her students. Donya teaches in a girls-only school located on the frontline between Houthi militias and other armed resistance groups. It is nearly a year since the government paid her salary. But she is only absent when it is too risky for her students to attend. Attacks on her school – which was once hit by an airstrike and on multiple occasions by missiles fired from the ground – left one of Donya’s students dead and another severely injured. The launch of Saudi-led coalition airstrikes in March 2015, and the ensuing eruption of internal conflicts between different armed groups, has had a devastating effect on Yemen’s education system. ‘It is like a very sick child that you want to keep alive without getting any help,’ says Donya. Security is just the half of it. Her other challenges include high absence rates, shortages of books and resources, and much-reduced schooling hours. Last year she only covered half of the syllabus, so she lowered assessment standards and passed all the children in the hope that they had acquired the minimum knowledge and skills. Another major challenge is malnutrition; girls are fainting from lack of food. Thousands of school buildings are out of action. The conflict has seen all armed actors deliberately attack education infrastructure, regardless of location, authority or political alliance, despite widespread international condemnation. The fierce wave of violence has left some 2,300 schools either partially or completely destroyed and more than 1,600 unfit for use. School buildings are used for shelter, by the military and – most recently – as quarantine centres for victims of cholera; thousands of teachers and students are displaced. Some two million – nearly a third of school-age children – are now being deprived of their right to education. But Yemen’s teachers are not giving up – despite the fact that 70 per cent of the profession are now working on a voluntary basis, since government salaries stopped 11 months ago. ‘Many male teachers are working as market traders or builders on their days off,’ explains Sahar Foad, a teacher from Sana’a. School administrators cut hours to free them up to seek other jobs, to make this possible. Deprived of an income, hunger is starting to bite for teachers, too. For a while, local business owners distributed food baskets but these were sporadic and covered only a limited number of schools in major cities. ‘Teachers have cut their meals, and those of their children, to one per day. Some can no longer afford essential healthcare and medicines – but still, they continue to attend to their classes,’ says Sahr. Yemeni teachers continue to show extraordinary commitment. Eighteen months of war and its associated traumas have left at least 10,000 dead, according to the UN, and millions at risk of starvation. But despite hunger, security and political threats, teachers refuse to let their students down. Where there is no school, they gather displaced children around trees and give classes when they can. They are stepping up their pastoral role: offering psychosocial support to students traumatized by war and loss, intervening to stop young girls being married off or young boys being taken for child soldiers. Some bring food from their own kitchens to feed hungry students. Without these champions of hope, a whole generation could have been deprived of their right to education. Sawsan Al-Refaei works for the Arab Campaign for Education as a Policy, Advocacy & Research Co-ordinator. In South Sudan only 30 per cent of girls enrol in secondary school, and more teenagers die in childbirth than complete their education. Nyanrror Teresa Marial reports on a second-chance project transforming their prospects. 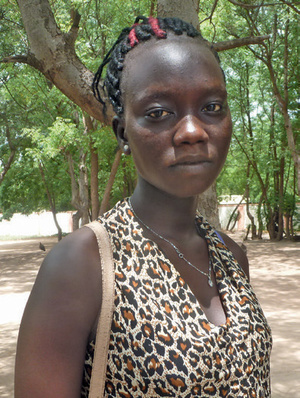 ‘Where I live in Rumbek, the Lakes region of South Sudan, girls face many barriers to education. Poverty stops some parents from being able to pay school fees, and there is also a heavy domestic load on girls, which eats into their time. Some parents, through ignorance, just don’t want to educate their girls. Another problem is that girls can be married off early, very young or by force. We don’t have the right to choose the partner we wish to marry – our parents give us to the one who pays the highest dowry in cows. Now there is more hunger, people are desperate and marrying off girls to get cattle to survive. Girls can become pregnant unexpectedly. This happened to me when I was studying, and I had to leave school to raise my daughter, who is now three. My brother-in-law brought me to a learning centre for girls who have dropped out of school – Accelerated Secondary Education for Women (ASEW), run by the Africa Educational Trust. ASEW wants to help girls finish school, rather than be married off for cows and goats. When I came to the ASEW learning centre, I saw that the headteacher was a woman – and that inspired me. ASEW was a school without punishment, school fees, and with free scholastic materials. It was a day school – not boarding school – that gave me time to help at home, caring for my daughter and my mother. There was a crèche, and the curriculum was speeded up so we could complete our education more quickly. It was also safe, protected from outsiders – it is extremely dangerous for women and girls as there is conflict all around Rumbek, since war began in 2013. We often hear gunfire and there are many cattle raids. The majority of the parents don’t allow their girls to go to school. Yet ASEW got the highest scores in our region, the Lake State, and the ninth highest position in the country. I studied hard and passed with a top score of 77 per cent. I want to attend university, study accountancy and get a stable job. Once I have a job, I will think about getting married. Men prefer educated girls these days, women who can speak for themselves. From passive students to active members of society – the Escuela Nueva model gives children more power and autonomy. Mónica del Pilar Uribe Marín describes how the vision of one Colombian teacher became a worldwide phenomenon. Oscar looked at the clock, drank his coffee, grabbed his motorbike and set off for a small, rural primary school in Norte Santander, on the Colombian border with Venezuela. He found his students awaiting his arrival. He got off his bike and reached into his pockets but had forgotten the classroom key – again. His students looked on, impatient. They would now have to wait while he went to fetch it. Oscar Mogollón looked at him and decided that this was the moment to put into practice an idea that had always obsessed him – giving his students more power and autonomy. He felt they were responsible, capable of taking part in school activities and guiding the teacher. So, he handed over the key. That day in the Colombian countryside in the mid-1960s, the Committee of the Keys was born. It was to be the first of many. Oscar and his students formed committees to cover health, the school garden, the library and so on. All together, they made up a system of ‘School Government’. Oscar understood the importance of bringing in the wider community and parents. So next he created the ‘Communitarian’ element. Parents began to help out, gardening and rearing pigs to raise money to buy new books. He didn’t stop there. As his wife and fellow teacher, Marina Solano de Mogollón recalls, Oscar rolled out his model in another 200 schools in the region. Teachers would meet in the afternoons to fine tune educational materials. They hit on the idea of creating hand-written documents (‘Academic Guides’) and using different colours to differentiate subjects and grades. As the children outnumbered the documents available, teachers pegged them on a music stand fashioned from branches so that everyone could work from them. What emerged at Oscar’s school would go on to revolutionize education in Colombia – and across the world, particularly in rural settings. In the 1980s he joined forces with fellow Colombian Victoria Colbert to develop the Escuela Nueva methodology. Some 50 years on from the Committee of the Keys, this pedagogical model is still going strong, now used in 25,000 schools in Colombia and in 16 other countries, across the world. Now a teacher, he uses it wherever he can. ‘We turn a passive student who repeats information into a student-researcher, able to build knowledge that helps society,’ he says. The Escuela Nueva method draws on the thinking of Brazilian educator Paolo Freire, among others, who said that teaching should break with hierarchical power relations that have an all-knowing educator dish out information in a one-way process. De-centring the teacher, and encouraging children to take control of their learning has been documented by the World Bank and UNESCO to have had some astonishing results. Escuela Nueva scores higher on traditional measures too, with lower drop-out rates, high community participation and better performance in some subjects like mathematics and language. Oscar died in 2009. But the innovations of this charismatic teacher will continue to impact on children’s education all over the world. Versions of his model are actively taught in Guatemala, Nicaragua, Peru and other Latin American countries, in Equatorial Guinea and Uganda, as well as Timor-Leste, Vietnam, and the Philippines.